The Art of the Mixtape – New Mixes, Classic Tastes. Classic Album Series: To Be Young, Gifted and Black: Donny Hathaway’s Everything is Everything. The only simple fact about Donny Hathaway was that he had talent. It wasn’t self-evident, not in the beginning, and maybe not even by the end. Rather, his talent, profuse and overwhelming, drew others to him. Even now, where most exposure to the man is limited to his involvement with Roberta Flack. Just hearing his voice tells you, instinctively, that this man had a tremendous gift. But that’s just the beginning to Donny Hathaway, and Everything Is Everything is one of the few complete portraits of his potential. It’s an album that’s inspiring in its clarity, its timelessness, and spirit. The 1970 debut of wunderkind session player Donny Hathaway showed more than a singular voice. This was a man who truly had soul, could arrange full band compositions on the fly, and who could really play the hell out of a piano. But where does one start with Donny? A four-year-old singing gospel while playing ukulele may have seemed like an unlikely, though appropriate start to a musical career, but Hathaway was more focused on music education by the time he was in high school. Hathaway’s foray into music as a profession began in 1964, when he met Ric Powell at Howard University. As Powell wrote in the liner notes to Everything,“he was in school on a fine arts scholarship, studying music education, unsure whether to be a Preacher or a Teacher,” before “due to the high cost of living” they formed the Ric Powell Trio, and performed gigs around the DC area. This trio would prove important in Hathaway’s career — the bassist Steve Novosel was married to Roberta Flack, who would collaborate with Hathaway later on, their duets perhaps the most lasting commercial impact of Hathaway’s all too brief career. Hathaway didn’t want the spotlight, or at least didn’t seek it out. But the spotlight was looking for him. Howard University was a focal point for black musical talent in the 1960s, and Curtis Mayfield discovered Hathaway singing in a university choral group, a group he would later christen ‘The Mayfield Singers,’ and implored Hathaway to work at his newly formed label Curtom Records. While Hathaway’s impact on recordings like The Impressions smash The Young Mods’ Forgotten Story can’t be measured directly, there is no doubt that the joy that Mayfield and company found in their own music, and the way The Young Mods’ Forgotten Story worked social consciousness into song no doubt had a profound impact on Hathaway. It became clear in Chicago that Hathaway wanted to be a solo artist. As much as he admired Curtis Mayfield, he realized that he “needed to say certain things that weren’t possible while we were together,” and began to cobble together a line-up for an album while working with other Chicago session musicians at Chess Records. Split between thinking he didn’t have the talent to make it on his own, and knowing that he could perform, Hathaway demoed “The Ghetto” to close confidant Sidney Barnes, who told him, “Donny, this is a monster.” But it was another musical mentor of the era, one who had played with the likes of Sam Cooke, who would give Hathaway the break he needed. King Curtis, so the story goes, had heard Donny singing in an elevator. Not any particular song, mind you, but the hum of the elevator motor, replicated by Hathaway’s uncanny, perfect pitch. Curtis was floored by the man’s talent. When he heard the then as-yet-unreleased and self-produced Everything is Everything, he just about ran to press the record into the hands of Jerry Wexler, the head of Atlantic Records, who released it on the Atlantic subsidiary, ATCO Records. In an interview long after Donny’s debut, Jerry Wexler recalled, “He was the most brilliant musical theorist I ever encountered.” Coming from a professional who had worked with the likes of Ray Charles and Aretha Franklin, such praise was not given lightly. In keeping with his humble personality, Everything is Everything opens not with Donny, but with an ensemble. First, session bassist extraordinaire Louis Satterfield, then a female chorus, before Donny Hathaway calls everyone together to sing “everything is everything.” “Voices Inside (Everything is Everything)” is a purely joyful experience, both a sermon and performance, with horn swells and dashes of Hathaway’s electric and acoustic piano playing. However, “Je Vous Aime ( I Love You)” is where Hathaway’s strength in singing and arranging starts to shine. An ode to his wife Eululah, who contributes to the backing vocals here (surrounded in fact, by Hathaway’s own backing in a subtle show of affection), it showcases Hathaway’s perfect elocution and his way to transform traditional gospel idiom into vibrant composition, where to build or break the song. “I Believe to My Soul” is one of those songs that threatens to leap off the record and spring to life. It is also evocative of what producer Eric Mercury would later recall of Hathaway: “He hears the music, he hears the strings, he hears the production, he hears the drums, he hears the lyrics all at the same time,” The introduction is a remarkable back-and-forth between Hathaway’s piano before the whole band comes in. Yes, it may be a Ray Charles cover, but the reverence for this piece is not out of idolatry for Charles the man, but for the music he made. Going back and listening to the Charles original, you’re struck by the timidity of the recording. Charles sounds like he hasn’t decided what emotional reaction to have — weary, with a mournful Greek chorus — while Hathaway’s interpretation all but demands an apology from the cheating lover. Donny Hathaway had been exposed to a variety of musical traditions, from his early days in gospel churches, to the study of European classical music at Howard University, to the pop leaning elements of Chicago soul music, and it’s only fitting that his debut album reflects that ecumenical background. Certainly, his ability to wring the best out of others’ material became a calling card. He follows the Ray Charles cover with Erroll Garner’s jazz standard “Misty”, before hopping to the gospel-infused jazz nightclub groove of his own instrumental original “Sugar Lee”. “Tryin’ Times” was Hathaway’s message song, a story laced around a syncopated groove about the socio-political climate, one that managed to be the concise, matter-of-fact counterpoint to Marvin Gaye’s “What’s Going On”.“Thank You Master (For My Soul)” slowly unfolds as Everything is Everything’s forgotten masterpiece, spare vocal phrasing and undulating piano lines counter the punchy horn section that reinforces Hathaway’s spirited pleas of thankfulness. It’s only after these first seven songs that Hathaway brings in the single, “The Ghetto,” though in a much more fleshed-out form than what Barnes had heard, with a hypnotic back-hook and few lyrics to speak of aside from the constant refrain of “the ghetto,” echoing the futility and underlying hope of the situation in one go. Perhaps the greatest gift of Everything Is Everything is its ability, on repeated listening, to change your mind about what’s the best song on here. For now at least, Hathaway’s take on Nina Simone’s “To Be Young, Gifted and Black” takes that spot. Composed by Nina Simone and Weldon Irvine in 1969, “To Be Young, Gifted and Black” was a song inspired by A Raisin in the Sun’s playwright Lorraine Hansberry. Simone’s original is zippy, theatrical, energetic. It’s a celebratory tone, or at least a hopeful one, and almost always buttressed by a swell of backing singers. This is true of all the cover versions … except Hathaway’s. There is a deliberate point of saying “Gifted and Black,” in that it brings the two together as a united front. Of the numerous covers that followed Simone’s original, Donny is the only one to read it as if a judge handing out a sentence, “To be young, Gifted, ..and Black.” The tension of the arrangement alone makes you realize you’re listening to something Hathaway holds dear, and Hathaway pours so much into his reading that it can’t help but be the climax on an album full of them. Everything is Everything went on to perform modestly well on the charts, reaching #33 on the R&B charts and #73 on the pop charts, enough to show Atlantic there was a demand for more. Stevie Wonder, Aretha Franklin, Ray Charles, and even Carole King were immediate fans, handing Everything is Everything out to friends, and in Aretha’s case, later collaborating with him.Though not his most spirited (that would be 1972’s Live), nor his most spiritual (that would be 1971’s Donny Hathaway), nor even his most ambitious (1973’s Extension of a Man), Everything is Everything is Hathaway’s most complete album, a fully-fleshed expression of a singular talent. Many thanks to Emily J. Lordi, who contributed Donny Hathaway Live to the 33 1/3 book series, and was a tremendous resource to this piece. In January 1973, five men were convicted of conspiracy, burglary and violation of federal wiretapping laws for actions taken at the Democratic National Committee headquarters in the Watergate Hotel. Though the break-in had only taken place some six months prior, the investigation wouldn’t be complete until August 9th, 1974 when Richard Nixon resigned after facing almost certain impeachment. The drilling worked, and Roy C. Hammond christened the band with the name The Honey Drippers, and produced two songs, “Roy C’s Theme” and “Impeach The President”. Characteristically, Hammond’s major label Mercury Records didn’t want anything to do with a song that controversial, so Hammond had to release the songs on his own record label Alaga Records. In those days it was a lot harder to make it without the promotion of a major label, and without people to hear the record, the 45″ single became one of those obscure finds that would be tucked in the bargain bin. Some seven years later, with Nixon safely away from the Oval Office, the hip hop movement was getting started, with many aspiring producers digging through record crates to find that one perfect sample that nobody had. Aaron Fuchs was working with a New York DJ Africa Bambaataa who was gracious enough to let him scan through his record collection, with important details scratched out of course. Still, Fuchs caught his eye on the distinct yellow red label of Alaga. Everybody seemed to know everybody, and Aaron Fuchs knew a young man who went by the name Marley Marl. He was yet to become a famous hip hop producer, and yet to be name checked in a Notorious B.I.G. song, but he already had the ear for a good hook. How Marley Marl got the copy of “Impeach The President” from Aaron Fuchs is contested, but without it the sample that launched almost 700 songs would have never happened. Great drum break aside, “Impeach The President” has one heck of a hook, and that band could sure play. The names may change but sometimes the message matters more. Oscar Peterson is one of a handful of jazz musicians whose accessibility belies his incredible ability. Capable of some of the hardest swing that jazz ever produced from a set of ivory keys, Night Train is the entry point for many, with Peterson’s minimal trio at its peak. This is a truly cohesive unit, with Ray Brown on bass and Ed Thigpen on drums. There’s not a note out of place, not that you would expect one on a jazz record, but the playing here is superb. “Moten Swing”, “Night Train”, and “Honey Dripper” are all easy favorites, but of particular note is the original album close, “Hymn To Freedom”. Some will pick out the harmonic similarity between the main theme of this tune and Simon & Garfunkel’s “Bridge Over Troubled Water”, but there’s no evidence that Simon consciously copied the melody. When you get to the tremendous cascading rolls of piano that Peterson pulls off toward the end of the song, you’ve probably forgotten about that extraneous detail, and just reveled in the playing of these three great jazz musicians. You can click the image above for a link to the album on Spotify, and check out “Hymn To Freedom” below. 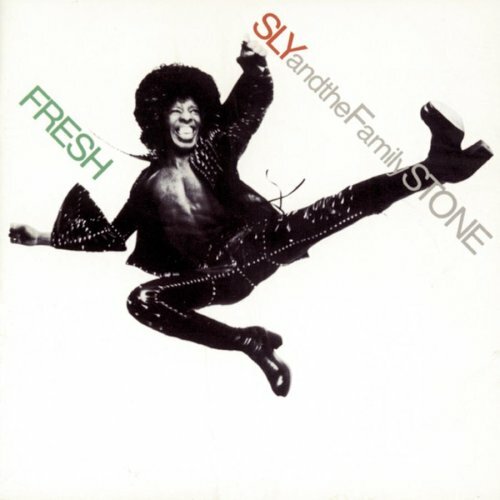 Sly & The Family Stone had already been through a hectic transformation by the time Fresh was released. Drummer Greg Errico and bassist Larry Graham left after the fractured sessions for There’s A Riot Goin’ On, a calamitous album that succeeded both by and in spite of the sheer nerve and drug-fueled paranoia of its creator. To this day, there’s nothing quite like the dark, drug-like Riot. Released a few years after in 1973, Fresh was an attempt to get back the band’s charismatic sound–but there’s no reining Sly Stone in from his creative flourishes. Take the first track off of the album, “In Time”. There’s the infectious groove that Stone could seemingly make out of anything, early drum machine loops, and a wiry, uncomfortable guitar hook that disorients as much as it ties the song together. Miles Davis was a huge fan of Sly & The Family Stone, and there’s rumors that he made his band listen to this song for 30 minutes straight to pick apart what was going on. If not a perfectionist, Sly was a constant tinkerer, he was infamous for holding on to the masters for his songs for as long as possible, leaving him free to overdub or tinker with the mastering of the recording for as long as he liked. At the time, such tinkering would often have a negative impact on the overall sound quality of the record, which is why Riot features the muddy, yet bewitching sound that it does. While Fresh kept some of the elements of Riot — like Sly’s penchant for using both live drums and drum machines, it’s an undeniably cleaner sounding record, and this helped produce the group’s last Top 20 hit, “If You Want Me To Stay”. Sly was a creative force, and even with new band members brought in to replace old ones, he had no problem playing both the organ and bass lines on the song. Sly still had an ear for a hook, and “If You Want Me To Stay”, with it’s lilting bass line and Sly’s signature vocal drawl is perhaps his finest. That doesn’t mean he was content with it– this clip from Soul Train shows Sly putting another hook on top, just because he could. There’s no denying Sly’s destructive behavior, and Fresh would be his last acclaimed album before the band disintegrated in 1975. While addiction and the inconsistent behavior that went along with it marred Sly’s musical career, his music and eclecticism left a mark. Prince, especially in his early years, sounded like a marriage of Rufus with Chaka Khan and Sly & The Family Stone, right down to the wiry instrumentals and love for drum machines–not to mention his patently bizarre behavior. Prince collaborated with Janelle Monae in recent years, and there’s a little homage to “If You Want Me To Stay” in “Electric Lady” with the bass hook. Sly himself has been quiet in recent years, though there’s been rumors of comebacks from time to time. David Kamp had a wonderful piece in Vanity Fair a decade ago that covered one such attempt. Charles Mingus was my first jazz obsession. For a kid that grew up more focused on The Beatles, Jazz seemed aloof to me – at first. My brother had taken up Miles Davis and John Coltrane rather quickly, and I therefore had to be opposed in my formative years, as siblings do. Larger than life in many respects, his personality burned brightest on record. There’s very few Mingus records where you can’t hear Mingus exhorting his bandmates in the background, shouting and growling. Mingus had idolized Charlie Parker and how, “sometimes, he could make the whole room feel like he did”. If there could be any defining mission of Mingus– that is probably it. He played bass, and played it exceptionally well, but his skill was most manifest as an arranger. Nobody charted horns like Mingus and it was no small thing that his bands included the likes of horn luminaries Eric Dolphy and Roland Kirk. His ability to make order out of disorder is the quality that makes him so exciting to listen to, and makes his works sound so human. It’s particularly hard to note any record as out of the ordinary for Mingus, because there hardly seemed to be an ordinary, but Oh Yeah stands apart from the ’59 triumvirate of Blues & Roots, Mingus Ah Um, and Mingus Dynasty as well as later works like Mingus Mingus Mingus Mingus Mingus, and The Black Saint and the Sinner Lady. Mingus plays piano instead of bass, something he would revisit with Mingus Plays Piano and even sings on a couple tracks, “Oh Lord Don’t Drop That Atomic Bomb On Me” included. Predating both the Cuban Missile Crisis and Doctor Strangelove, “Oh Lord” manages to foreshadow the humanism and absurdity of both, a ballad with wonderful piano flourishes and Mingus’s direct emotional appeals. Sadly, the article from which that Cassavetes quote is sourced is no longer available online, but exists as an excerpt in a comment on a blog here. It was written for Stylus Magazine by Chris Smith. The whole album is fantastic, though I find myself torn between “Oh Lord”, “Ecclusiastics”, and “Eat That Chicken”. An Argument With Instruments: On Charles Mingus found in the October 7, 2013 issue of The Nation by Adam Shatz, is a great overview of Mingus’s character and relation to his jazz contemporaries. On an earlier edition of these pages I wrote about the incredible work that Matthew E. White had done with his debut record, Big Inner. Both his knack for rich analog production, and the wonderful house band at Spacebomb Records in Richmond, Virginia elevated the record into rarefied territory. The result was resplendent, with well-crafted songwriting polished by incredible detail. It was no surprise then that White continued to do great work, taking a more pronounced role behind the boards on the debut self-titled record from Natalie Prass, Natalie Prass. That record received a lot of high praise, with production that sounded like Randy Newman and Curtis Mayfield had produced Dusty in Memphis. This stylish 70s meets 90s rave-up is a different direction for Prass and the Spacebomb band, more reminiscent of Feist at her best in the early 00s and a good study in giving a song the time to develop into something beyond its initial framework. And yeah, that bass and guitar work is incredible. I’m still not entirely sure how I discovered Hiss Golden Messenger, though I strongly suspect it had something to do with the fantastic music blog, Aquarium Drunkard . In 2013 Haw made its way into my music library, and I went down the rabbit hole to explore the rest of their discography. © 2019 The Art of the Mixtape.